After an exciting career traveling the world while working for the US Embassy, Ben and Elaine N. were ready to build their dream home. 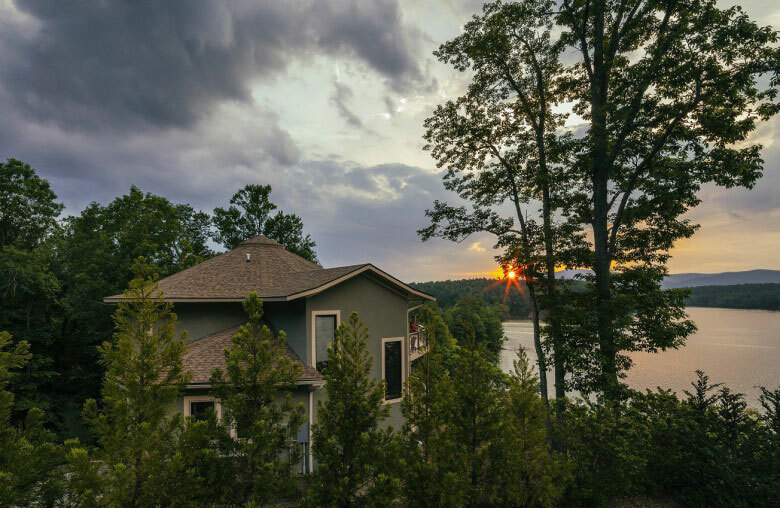 They decided on a quiet, lakeside community on the shores of Lake James in North Carolina. Ben and Elaine’s first step was to attend a seminar. They were so taken with the entire experience, they discussed it over a barbecue dinner immediately afterwards…and ended up sketching their floor plan out on a paper placemat, which they promptly sent off to their design and project manager, Chad Moore. They built a two story 1,500 sq ft model on a basement. They went with ten-foot walls on the main floor, but given the airiness of the signature domed roof of a Deltec, they went with nine-foot walls on the upper floor. They personalized their home in various ways: a unique gray-green stucco exterior, a covered entryway and a stairwell wing (complete with elevator) specifically built to house large stained glass windows. The stairwell is placed to the side of their home where the nearest neighbors are located, and the stained glass gives more privacy.